I’m just going to jump right into this recipe, because, even though it’s worth waiting for, I really don’t want to and I know you’re going to love it! 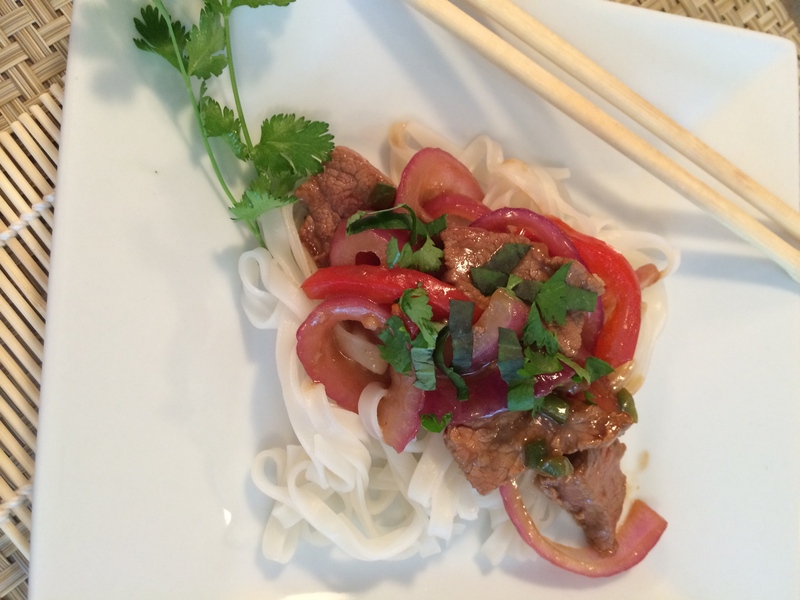 I made it for dinner one night and it instantly got “pinned” in my favorites category in my recipe keeping app I use. And that’s saying something, because out of all the recipes I have (and I have a lot! 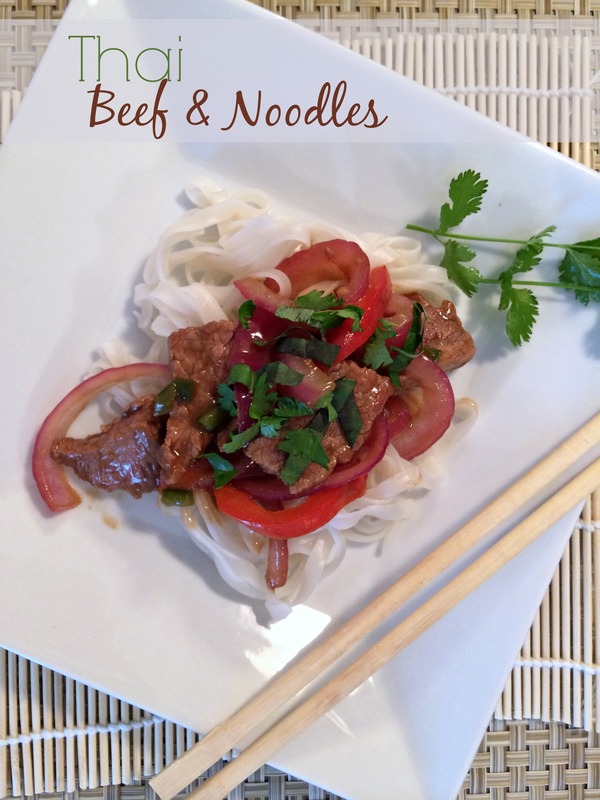 ), I only have 19 favorites; two of which are my Homemade Granola and Cookies ‘n Cream cookies…so this Thai Beef & Noodles is ranking pretty high! 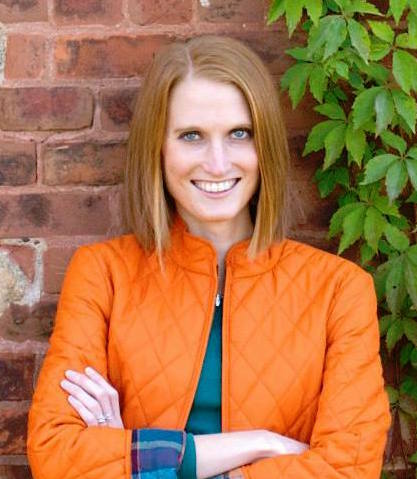 Ok, well I guess I have one thing to tell you really quickly before I share more on this new, delicious favorite of mine (maybe just a little suspense here for ya! )—Philip and I went to our garden yesterday and we were welcomed by our first produce of the season! One small little radish. It probably wasn’t quite ready yet, but we picked one anyway and let the rest continue to get bigger. Sorry for no picture (since a radish is so exciting, right?! ), but I didn’t have my camera with me to document this event and then Philip popped it in this mouth after cleaning it before I could even process what was happening. A little glimmer of garden success lifted our spirits, since we’re still trying to figure out what the heck we’re doing. Live and learn! Onward, shall we? I don’t really know why I’m drawn to Asian cuisine so much when cooking (as I’m realizing I have quite a few that I’ve posted on my blog, already), but I think it has something to do with all the fresh ingredients used, the amazing color, and the simplicity of them. This is kind of like a fajita except with more of an Asian flare (and no tortilla)….so I guess it’s more like a stir fry, but for some reason all the peppers makes it seem more like a fajita, in my opinion. Either way, it’s delicious! The peppers and red onion give off great color and the added cilantro gives it that extra freshness to really make everything pop. The marinade is really simple to whisk together and, although the ingredient list may look a little lengthy, they’re practically all seasonings and staples you probably already have. The marinade has just a little bit of kick, but not so much that it covers up the great, natural flavor of the flank steak that is cut thinly against the grain. The most important thing is to not overcook the meat! 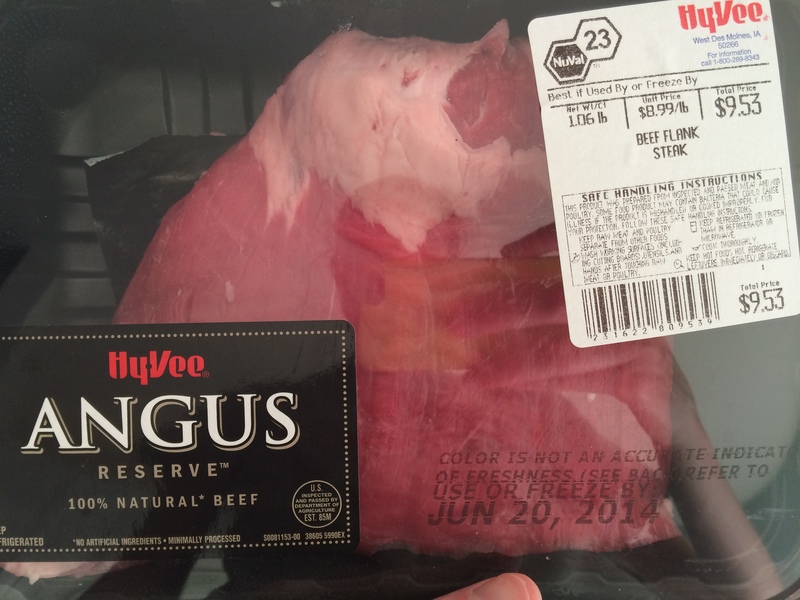 What’s worse than spending the money on steak and having it turn into leather? About a minute on either side is long enough to get a nice browning on the outside and then a little bit longer (a couple minutes) with the remaining marinade and peppers added in, simmering on low, should do it. Since this recipe comes together so quickly I did all my prep work before I even started with the cooking. I kind of like it that way, because once I’ve gotten the marinade made, the steak marinating, the noodles well on their way to being done, and the veggies cut, it’s the fun part of just combining things together. And you know what else makes this recipe go even faster? 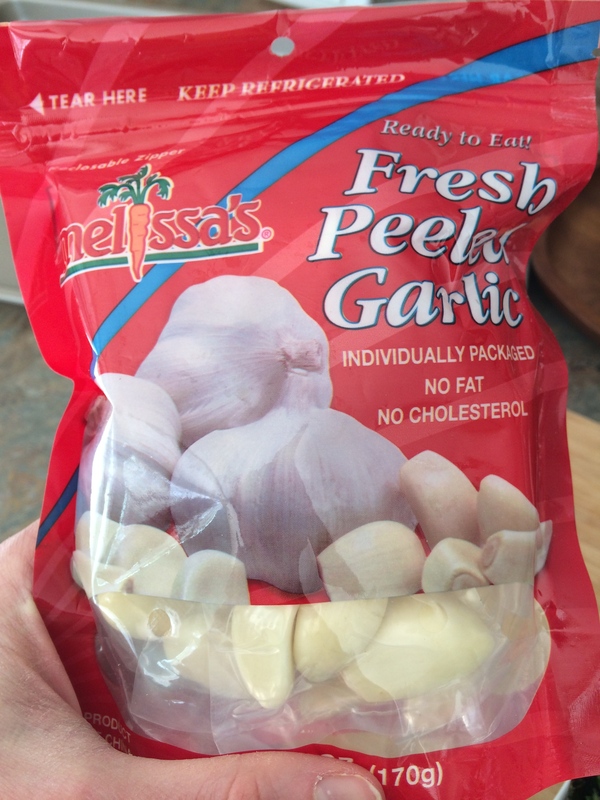 Having pre-peeled, fresh garlic! I got these as a sample to try and I absolutely love them! 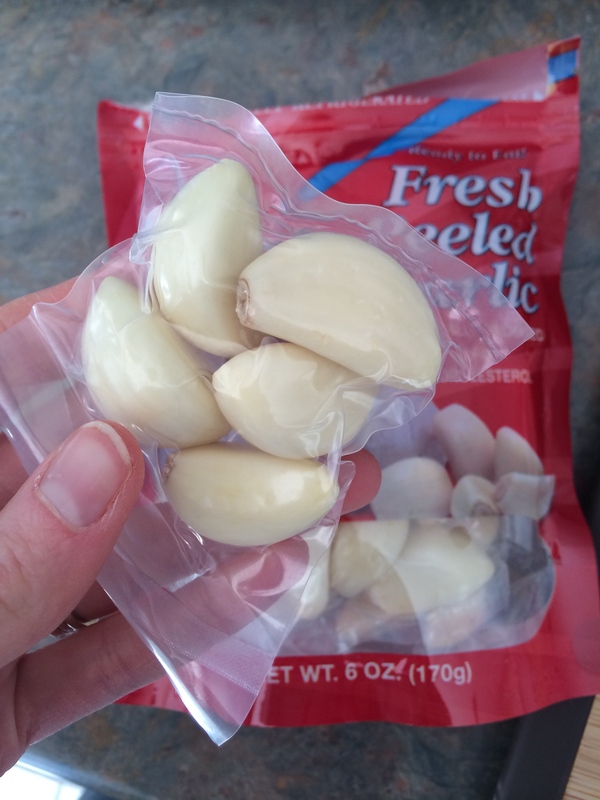 The garlic is already peeled and about 5 cloves are individually vacuum-sealed, so you don’t have to go through a whole package all at once. So handy! Although I probably wouldn’t spend the money on this (unless I had that luxury to spend money on something like pre-peeled garlic), it was really nice to use while they lasted! If you’re looking for ways to speed things up, this is it! 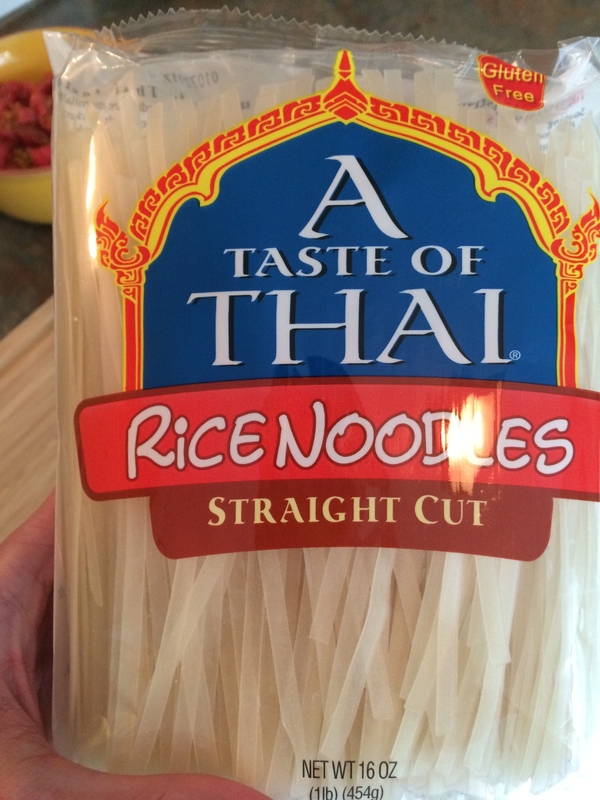 I think what really makes this dish “authentic” are the rice noodles. These are not whole grain and probably are not the best choice health-wise, but they’re so good! The noodles don’t weight down the meal like noodles sometimes can and they are just plain, fun to eat. However, using whole grain linguine would totally work, too. 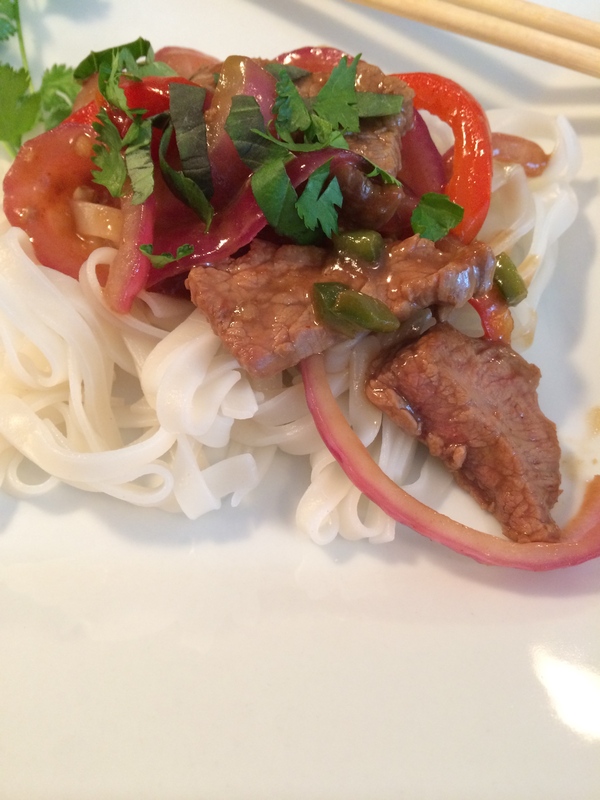 You can find the rice noodles in most any grocery store in the international aisle. 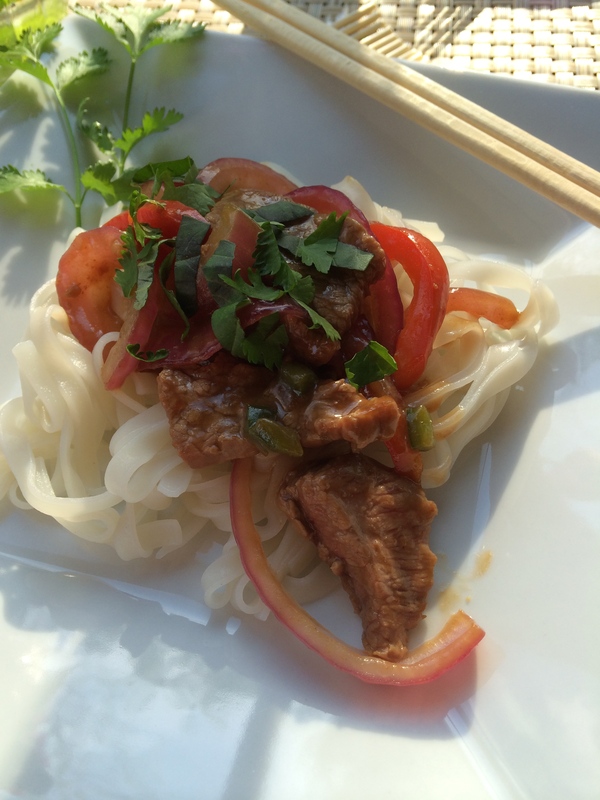 Plus, rice noodles take no time to cook. They’re done in about 4 minutes. When draining them, make sure to give them a rinse in cold water to prevent them from sticking (there is some kind of intense attraction between these noodles!). Cook desired amount of noodles according to the package directions. When draining rice noodles, rinse with cold water and drain again to prevent the noodles from sticking. In a small bowl, mix the soy sauce, vinegar, cornstarch, brown sugar, ginger, chili garlic sauce, garlic and the lime juice. Pour a third of the marinade into a bowl with the sliced beef and toss to coat. Save the remaining marinade for later. Heat 1 tablespoon of the oil in a large skillet over medium-high to high heat. When it is very hot, throw in the onions and cook for a minute or so. Add the bell pepper and jalapeño. Cook for a minute, tossing until the peppers have brown/black bits but are still firm. Remove the vegetables to a plate. Add the remaining tablespoon of oil to the hot skillet. Add the meat mixture, evenly distributing it over the surface of the skillet. Allow to sit for 45 seconds, then turn with tongs. 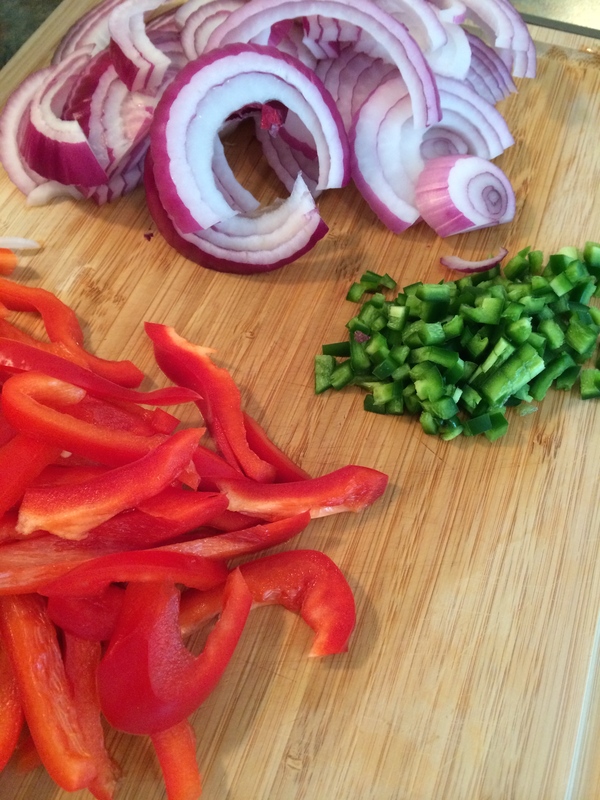 Cook for another 30 seconds, then add the onions and peppers back into the skillet. Reduce the heat to low. Pour in the remaining marinade and stir. Allow to simmer on low for a few minutes; the sauce will slowly thicken. Turn off the heat. Toss in the noodles to the mixture, if desired. Or, top the beef mixture on top of the noodles. Stir in some very hot water to the beef mixture, if needed, to thin the sauce. Top with basil and cilantro leaves and serve! Squeeze more lime juice onto serving, if desired.